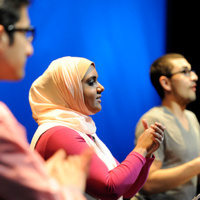 Beyond Sacred is an interview-based theater production by Ping Chong + Company exploring the social challenges faced by young Muslim Americans — at school, at work, and anywhere else. The 5 young performers in Beyond Sacred hail from diverse cultural and ethnic backgrounds, reflecting a wide range of Muslim identities. Together their true stories create a beautiful, funny, and intensely poignant cry for acceptance at a time when such sentiments are more necessary than ever. This project was funded in part by grants from the Richard S. Shineman Foundation, Humanities New York with support from the National Endowment for the Humanities, and Stewart's Shops.